Regardless of your packing prowess, in the rush to prepare for a family vacation, mistakes can easily be made. 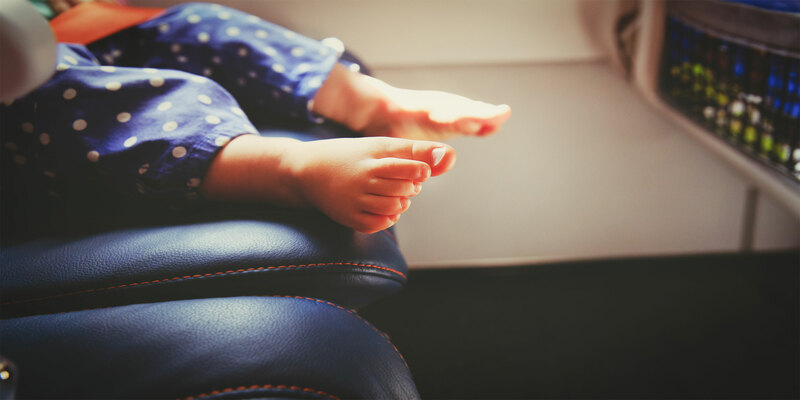 But if you plan ahead, stay organized and anticipate your family’s needs on the plane, you can avoid making these nine common carry-on errors. It’s a sad day when you have to watch your favorite face cream get trashed at the airport because it was slightly over the size limit. Make sure shampoos, soaps and gels are all under 3.4 oz. or 100 ml. If not, stash some of your favorites for your trip in silicone refillable travel containers. Silicone makes it easy to squeeze out every last drop and the wide openings are simple to fill. As a young mom, I packed extra clothes for my baby in our carry-on, but not for myself. When his diaper blew out, he could be comfortably changed, but I had to sit in wet clothes for the remainder of the flight. You never know when an unexpected mess might come up! “Make sure carry-on luggage is as small as possible, so it fits underneath the seat,” says Jenss. If the plane is full and they start to gate check carry-on bags, yours will still make it on the plane with you, if it fits under the seat. This Samsonite piece, with wheels and handles, is a breeze to travel with. Pockets make it possible to store more than you think you could in this fantastic bag, available in a variety of colors. Flights can be delayed or hunger can sneak up, especially with little ones in tow. Airport snacks can be expensive and it’s easy to gravitate towards unhealthy food. RXBARs are bestsellers because they have a few, simple ingredients with no preservatives and can easily fit in a purse or diaper bag. Chocolate Sea Salt can taste like a treat, while delivering uncomplicated protein. Colored pencils, stickers, small cars, whatever your kid is into — bring small, new toys to keep them entertained without the blue light and noise of electronics. Wikki Stix keep little hands busy while their minds are imagining. These Crayola washable markers come in a convenient, portable set. Melissa & Doug color-by-number and reusable sticker sets are perfect for travel and promote hours of independent play. Nothing is worse than sunscreen that has spilled all over inside your bag. Keep bottles of lotions and potions separated and safe in a toiletry bag (much better than plastic food bags). This toiletry bag with a hanger keeps it out of the way in the bathroom and off the wet and cluttered sink counter once you’ve arrived at your destination, too. My favorite earrings recently arrived at an out-of-town wedding crushed and damaged. Now I store them in this thin, stylish jewelry organizer. The separate sections help keep necklaces and other baubles from getting tangled. Plane rides are the perfect time to catch up on your reading. Don’t lug loads of magazines or limit yourself to just a few novels. Instead, pack a Kindle and almost anything you want to read is at your fingertips, in a lightweight device. Download a few choices in advance, but you also have the ability to buy a new title when someone raves about it on the beach chair next to you. Do you ever rifle through your bag in search of socks or underwear? Avoid wrinkling your clothes or throwing things around the room. When you keep your carry-on neatly organized, packing is easier and getting dressed can be less stressful. Packing cubes keep small items together and are great for children’s clothing.